Back in 2013, I tried to grok the state of the theatre for young audienes (TYA) field in an op-ed for HowlRound. I wrote about what I called tectonic shifts in American and international organizations, leadership transitions, connectons, and emergence. Today, that article reads like a period piece from a quaint, earlier era. Or from another planet. A few of the events and trends since then, in both our cultural and political lives, include the 2016 US election; Brexit; #MeToo; #BlackLivesMatter; mass shootings in Las Vegas, at the Pulse nightclub, in Parkland, and elsewhere; unprecedented numbers of women and persons of color elected to Congress in 2018; new levels of migration from poverty, war, and violence; the rise of right-wing nationalism; the 24/7 news cycle; and lives being lived on social media. If the world now is such a jagged and incomprehensible place that we adults are struggling to navigate, imagine how it is for our children and young people. In the wake of all this, there is bad news and good news for the TYA field. The not-so-good news is that, per both chatter from practitioners and an article in TYA Today Online, there is a great sameness to many of the seasons of our TYA theatres. Of the eleven most-produced TYA pieces in 2018–19, with three to six separate productions each, eight are musicals and all are adaptations. This most likely stems from multiple factors, which include economic fears, political hot-button issues, pushback from boards, and/or resistance from the dreaded gatekeepers—institutional and parental. The positive news, though, is that many of us, not only in TYA but also in the wider theatre world, are more strongly than ever focused on listening and talking to young people—truly hearing their voices—and reflecting their stories on our stages. An important takeaway from listening to young people is that they tend to not self-censor the way so many older artists do. This helps theatres focused on TYA to continue to stretch the boundaries in both form and content, including telling more daring stories that cross into areas long considered taboo. What is classified as taboo or difficult is, of course, different for individual communities, cities, and countries, but often involve stories with violence, gender identity, racism, and physical or sexual abuse. Below are some examples of bright spots we’ve seen in the last little while in the TYA field, which we can expect to continue, especially related to original plays. I have long believed that the major reason for the growth and far-reaching improvement in the field is due to our support of playwrights. The most-produced TYA artist of the 2018–19 season is Latinx composer Deborah Wicks La Puma, with at least thirteen productions. Karen Zacarias, the most-produced Latinx playwright in the country, also writes TYA musicals with La Puma. Additionally, Karen was a prime mover of the gathering in Washington, DC that eventually led to the formation of the Latinx Theatre Commons (LTC). The 2019 Latinx Theatre Commons Theatre for Young Audiences Sin Fronteras Festival & Convening, the first LTC convening focused on TYA, could not have happened at a more auspicious time, what with a growing Latinx population and presence in the United States, as well as because of what’s happening to young people at our southern border. The festival, which took place in January of this year at the University of Texas at Austin and the Mexican American Cultural Center, featured 150+ artists and practitioners, presented productions from Mexico, Chile, and the United States, and included programming focused on Indigenous voices and Latinx youth. Tomas and the Library Lady. Photo by Erika Alvarado. American Latinx playwrights with productions or readings at the convening included José Cruz González (Tomás and the Library Lady), Rupert Reyes (Cenicienta, with Caroline Reck), Ramón Esquivel (Dulce), and Miriam Gonzales (Óyeme, the Beautiful). 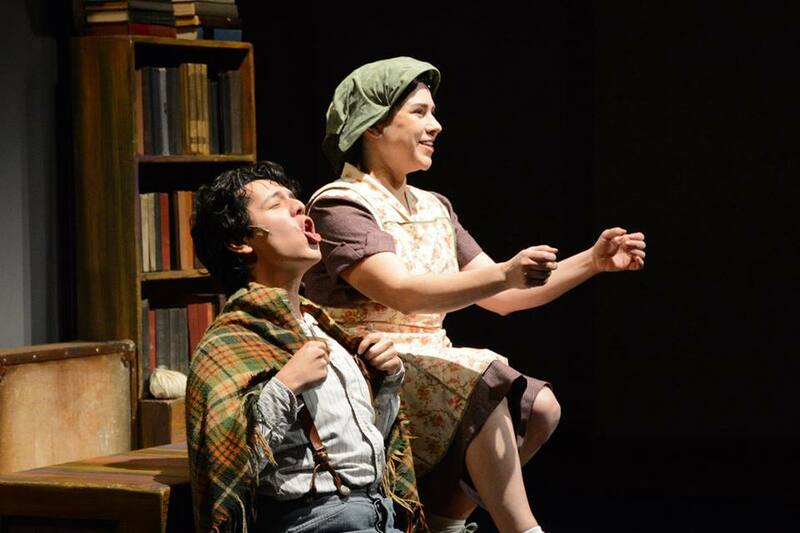 The plays were about what libraries can make possible, how a family was changed by a dead grandmother who appeared to the young son, and the struggles of immigration, as well as included a bilingual updated Cinderella. Playwright José Casas spoke about the landmark anthology he co-edited, Palabras Del Cielo: An Exploration of Latina/o Theatre for Young Audiences, a book for producers, scholars, and students that’s the first to feature Latinx TYA is such a fulsome way. During the spring of 2018, in an unprecedented convergence, Oregon’s three largest theatres each produced a new work by a Native American woman—two of whom are also activists and write for young audiences as well. Larissa FastHorse (Sicangu Lakoka) is on the Theatre Communications Group board, has had her commission of Average Family produced at Children’s Theatre Company, and has another work in progress with them. Mary Kathryn Nagle (Cherokee) is a lawyer and head of the Yale Indigenous Performing Arts Program (which includes an annual Young Native Storytellers Contest), and recently had her play Return to Niobrara commissioned and produced by the Rose Theatre in Omaha. Work that collaborates with Indigenous artists and provides deserved access to resources for them is something seen in many theatre companies in Canada, but especially TYA companies. To our north, there’s a growing consciousness in Canada toward the need for greater understanding and relationship building by settler culture toward Indigenous culture. Work that collaborates with Indigenous artists and provides deserved access to resources for them is something seen in many theatre companies in Canada, but especially TYA companies. The (arguably) flagship Young People’s Theatre in Toronto has committed to ensuring that at least one Indigenous show, either from companies across the country or produced by them with Indigenous artists leading the process, is part of each season. ASSITEJ International, the association for theatre for young audiences, which was founded during the Cold War, saw major constituational changes in 2011 (see my previous op-ed). This kickstarted and helped advance the transformation of the organization from one focused on Eurocentric text-based theatre to one that embraces all practitioners, all countries, all forms, and all levels. That the organization’s 2017 triennial world congress and festival was the first-ever held in Africa is a sterling example of this sea change. The event, held in Cape Town, was called Cradle of Creativity and was organized by ASSITEJ International (and ASSITEJ South Africa) president Yvette Hardie. South African theatremakers continue to be involved in projects for young audiences in collaboration with theatres around the world, notably through the groundbreaking four-country, seven-organization International Playwrights Intensive (IPI). In the spring of 2016, the IPI helped develop new work from India, Korea, and South Africal as part of the Kennedy Center’s New Visions/New Voices festival, working also with the University of Maryland’s Department of Theatre, Dance, and Performance Studies. On top of this, an exciting “Creative Europe” project called PUSH+ is being honchoed by Imaginate in Scotland in collaboration with groups in Denmark, Belgium, Norway, Ireland, and Thailand. What is of particular interest about the initiative to everyone in the field is how artists are given the opportunity to play and explore around “difficult” or unrepresented themes and theatrical forms with no pressure on outcome. Finally, one organization doing great work is Spinning Dot Theatre in Ann Arbor, Michigan, which was founded by Jenny Ann Koppera in 2014. Its goal is to emphasize global stories to connect their audience with the rest of the world. In the last five years, they’ve produced work by playwrights from Kosovo, Australia, Japan, Canada, South Africa, Germany, Denmark, and Ireland, using both adult and young actors. 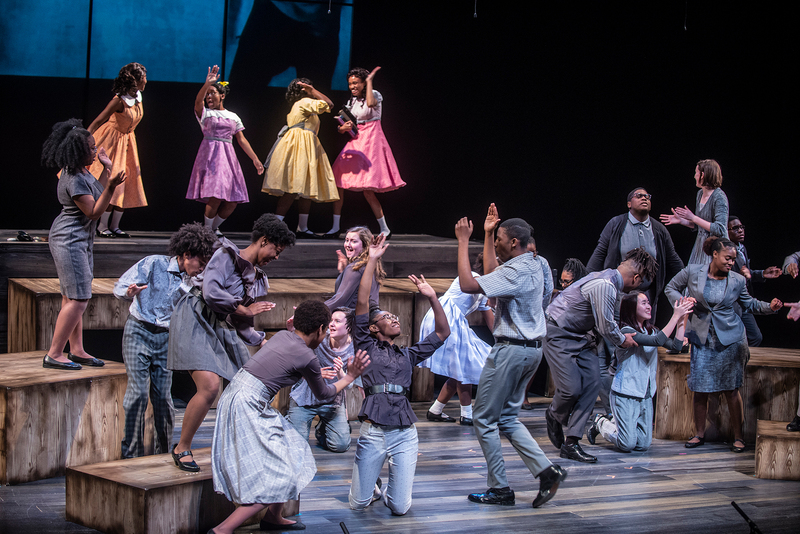 Our American TYA landscape continues to feature noteworthy plays by African American writers, including Idris Goodwin (And in This Corner: Cassius Clay and This is Modern Art with Kevin Coval), Cheryl L. West (Mwindo), Pearl Cleage (Tell Me My Dream), and Christina Ham (Four Little Girls: Birmingham 1963). There is also more hip-hop work for young audiences, two of the writers of the genre being Psalmayene 24 (Hip-Hop Children’s Trilogy) and Paige Hernandez (Paige in Full and Havana Hop!). The cast of Four Little Girls. Photo by Shannon Heupel, courtesy of Alabama Shakespeare Festival. Naomi Iizuka is certainly the best-known Asian American writing for young audiences, most recently with The Last Firefly for Children’s Theatre Company. Other writers include Lloyd Suh (The Wong Kids in The Secret of the Space Chupacabra Go! ), Alvin Chan (The Ballad of Mu Lan), Anu Yadav (Meena’s Dream), and Damon Chua (The Emperor’s Nightingale). The Pride Youth Theatre Alliance now has twenty-one queer youth theatre programs, troupes, ensembles, and individual members in thirteen states and provinces in the United States and Canada. The organization is all about safe spaces for expression, as well as representation in the community, and all of the work is driven by the voices of queer youth. Another important and growing trend, perhaps under the banner of identity, is the growth of sensory-friendly performances (also called relaxed performances), which are making the theatrical experience safer for young people with Autism Spectrum Disorder and other developmental differences. Chicago Children’s Theatre, with the Red Kite Project, and Milwaukee’s First Stage, with its Next Steps program, are just two of the many TYA theatres with specialized classes and workshops for these young people. Related, children’s singer Dan Zanes’ Night Train 57: A Sensory Friendly Folk Opera and Trusty Sidekick’s Up and Away are two examples of specially created performances for young people with developmental differences. This is only anecdotal, but my connections with young people and their writings make it clear that they, for the most part, accept and understand intersectionality far more than many adults and are capable of embracing overlapping classifications. Because their own lives are so fluid, so many of them consider the fluidity to be positive. They understand that people are not defined by any one attribute and know this adds to the richness of human (and theatrical) experience. [Young people], for the most part, accept and understand intersectionality far more than many adults and are capable of embracing overlapping classifications. It was a surprise to exactly nobody in our profession that many of the Marjory Stoneman Douglas high school students who started and continue to lead the #NeverAgain movement were drama kids. Theatre is, after all, a greenhouse for empathy. At its best, TYA creates a welcoming place for all young people, especially those who think of themselves as “the other.” It’s a place where our children and young people can see performances with characters (and actors) who look like them, talk like them, pray (or not pray) like them; live in families (non-traditional or traditional) like theirs; are immigrants like them; love like them; use pronouns as they do; are on spectrums like theirs; and who use sign language, wheelchairs, and white canes as they do. All of this exists in performances created by artists from the same bright mosaic of differentness. Theatre for young audiences is the only subset of our profession with its intended audience as part of its name, and the more intentionality we can honor young peoples’ voices with our voices, the more vibrant and effective our theatre will be. While we should never be nihilistic with our young people, and always give them hope, we can and should tell stories that embrace all of the joys and terrors of the world we all inhabit. Despite the sometimes soul-crushing negativity in our politics, despite financial and cultural concerns leading to safe choices, I continue to be optimistic about our field—and the playwrights who are changing the world one play, one child, at a time.